One of the drawbacks of using credit cards is that it opens up the possibility of spending more than you would otherwise. While this is often tempting, I think we are pretty disciplined. I would confidently state that we rarely buy anything we wouldn’t otherwise just because we’re using a card. We pay our credit cards off every month. No exceptions. This is critical if you use your cards. Otherwise, the interest charges would surely erase most if not all of the rewards you got from the card. But, by paying off the credit cards every month, our interest charges are exactly $0.00. That means that every single reward we get from our credit card is at little or no cost. I track our spending pretty religiously. When you pay for things on the credit card, it’s easy to log on and match up every charge with an assigned spending category. With cash, it doesn’t work. You can write it down or use an app, but that’s just extra steps. Honestly, the built in tracking that you get by swiping a card is very valuable to me. 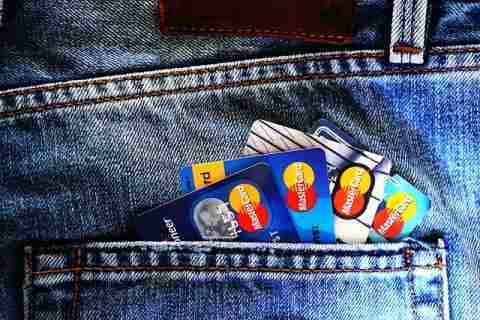 If I were to lose my wallet, I am at less risk of getting stuck for a loss with cards than with cash. If I drop cash, that’s pretty much assured to be gone. With a card, I can cancel it as soon as I realize it’s missing, and work with the card company in the event of any fraudulent charges. Readers, do you use credit cards or do you still find cash is the way to go? Like you, I do almost all of my spending on my credit cards — also for the rewards. Mostly I use the Citi Double Cash card unless my Chase Freedom has a 5% deal on a specific category. I transfer money out of my main account as I spend it, then make weekly payments to keep the balance sane. Personally, I’ve never found that cash helps me spend less. If anything, credit card spending has more of an impact because I have to go home and transfer the money out, meaning I see the total I’ve spent twice in a very short time period. Interesting. We only pay each card once per month, though I do track the spending daily as the charges post. We do the same for the same reasons. We have a good rewards card and have been able to travel exclusively off the points we earn on everyday spending. When I have cash for some reason, it takes forever before I need to go to the atm again…several months, sometimes. One great side benefit is that I no longer need to carry a purse. My credit card and drivers license fit in a pocket on the back of my cell phone. As a former purse-carrying person, this has been a revelation. And then you don’t have to spend money buying new purses. So you can add that into your cost savings model! Is it worth having your bank/credit card company know what, when, and where you buy everything? Then selling/distributing that data to who knows who? Or if there was ever a hack? Interesting point. There are definitely pros and cons to each. I think it just depends to what variables you consider most risky, and what your tolerance is to that risk. This is different between people.